Dropping in today is a charming boy who totally stole my heart in Tiffany Schmidt's (awesome) debut Send Me a Sign. His name is Gyver, and trust me when I say you want to know him too. That about sums it up. Do I get extra points for only using two words? What's your best memory with Mia? Do you know how many thousands of days I’ve spent with her? Can I have a minute to sort through them and pick? Okay -- I've got two. The first is when I gave her Jinx—that’s her cat. Someone had left a box of strays at the police station and I convinced my mom to bring a black one home—and this is after I convinced Mr. Moore to let Mia have one. This was all on a Tuesday. That Friday was a 13th, and I somehow managed to keep Jinx a secret until then—then surprised Mi. She couldn’t have been scared or superstitious that morning, even if she tried, she was too busy falling in love with the kitten. I was eleven, I felt like a super-hero for making her that happy. The other story is from eighth grade—and she's going to kill me for telling you. It was right after Mi quit gymnastics and joined the cheerleading squad. She was suddenly really busy with all these new friends, and I was starting to get serious about music, so a lot my time was lessons and rehearsing. We just weren't seeing each other that much. But anyway, the story takes place on this stupid field trip thing the school organized. It was a ropes course and was supposed to be team-building and help us "come together as a class before high school." Mostly it was cold and rainy and lots of guys trying to look up or down girls' shirts as they did the different climbing things. When it was Mi's turn to cross this log suspended between two trees, she got halfway across and froze. It doesn't make any sense—the girl is pretty fearless, she had on a harness, and that part was pretty much the same as a balance beam, which she's always rocked. Granted it was way up in the air, but she hadn’t had any problem climbing the rope ladder to get there. Anyway, she refused to move. And the rain was starting to pick up, it was the end of the day—everyone was getting pissy about it. The teachers wanted us back on the bus, the rope course instructors were yelling at her about how the log was only going to get MORE slippery if she kept waiting and it kept raining. All her new friends, they weren't teasing, but they weren't helping either. They were all "You can do it!" and "Just don't look down!" Then she called for me. She just said, "Gyver, can you come get me?" And I did. I climbed up there, held her hand, and just talked to her. We took it one step at a time. I guess it sounds cheesy, but it was that moment that I knew it didn't really matter who she ate lunch with or if we went to the same parties on Friday nights—I was still important to her, and she was always going to need me. Ah, that sounds lame—maybe just use the cat story. Admittedly, Mia's friends aren't fans of yours. Do you ever wish you could pull her away from them? All the time. I’m pretty sure she gets that from them too, so I try not to make it a game of tug-of-war with her the middle. And I guess it’s good that it’s mutual dislike between the Calendar Girls and me, because I really don’t want to be around her when she’s with them. But if she likes them and they make her happy, she shouldn’t have to choose between us. So, Mia sort of has a thing going on with Ryan, who you're not such a big fan of. Do you think Mia's wrong when she thinks there might be more to Ryan? I have no clue what she sees in Ryan Winters. She’s not shallow, so if she says there’s more to him, there’s got to be something there. I guess. I’m not touching this question. Or if you need something, put down that I hope my best kiss is one I haven’t had yet. Now I’m seriously starting to wonder why you’re asking these. You’re not creating some online dating profile for me, are you? Please don’t. For what it’s worth, boxers, and I’m not a fan of pina coladas or getting caught in the rain. I actually have an answer to this one! Triceratops. Mi and I went through a big dinosaur phase when we were little – her lucky number was three back then, so our favorite was always the triceratops. We thought we were going to be archeologists, or maybe it was paleontologists? We used to dig for fossils in my sandbox and her dad would hide these little rubber dinosaurs all over their house for us to find. Then we watched Jurassic Park and Mi got scared and that was the end of dinosaurs, I think we moved on to space, or maybe our forest ranger phase came next? Thank you, Gyver, for stopping in, and congrats, Tiffany, on the debut! 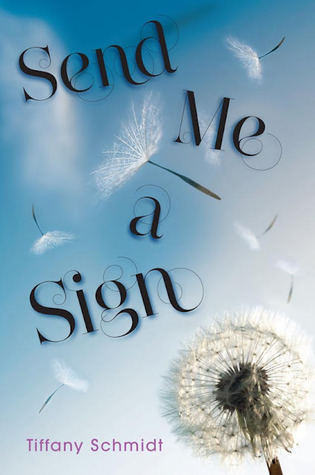 Send Me a Sign is out now, and there is even more Gyver-goodness in it, so you should definitely pick it up. Plus, it's an amazing book, with awesome characters, some great kisses, and another hot boy (but Gyver is my pick).